Buildings collapse into a fiery abyss. 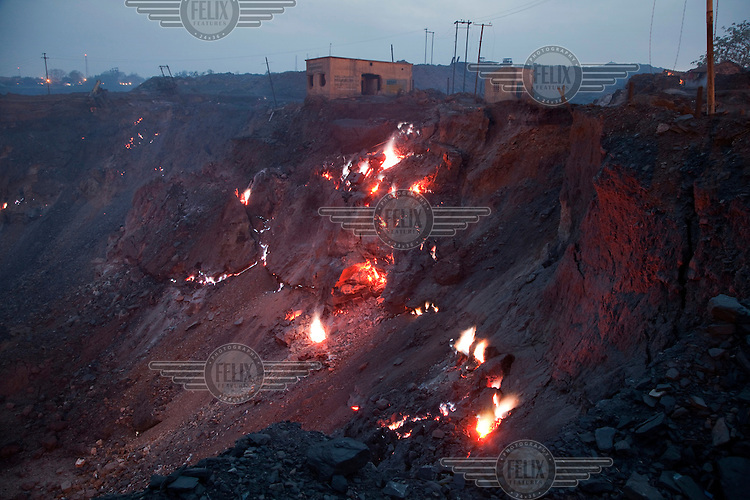 Due to the spread of open pit mining in areas where underground mines were previously operated, thousands of uncontrolled coal fires have broken out as oxygen has access to formerly covered seams of coal. The fires also ignite newly exhumed coal resulting in an estimated 30% loss before the coal can be transported away from the mines. Anti-mining activists claim that the coal companies are deliberately letting these fires spread in order to force people off the land and out of the areas where they want to excavate more open pit mines. The government has issued a moratorium on more open pit mines until existing fires can be brought under control, but in the race for quick profits, and with the cost and difficulty of putting out the fires, some of which have been burning for 100 years, most mining operations are ignoring this. ..